It's finally football season, and your kiddo just joined the youth league! Now all they can talk about is passing plays, interceptions, blocking, and how to run a perfect blitz...whoa...slow down, there, Junior! That's some advanced stuff. They might be too young to play tackle in the big leagues, but they are definitely old enough to score the game-winning touchdown and be carried around the stadium like the team hero! At least, that's the scenario that's been playing out in their head while they run around in the backyard, so you may as well help bring it to life this Halloween. 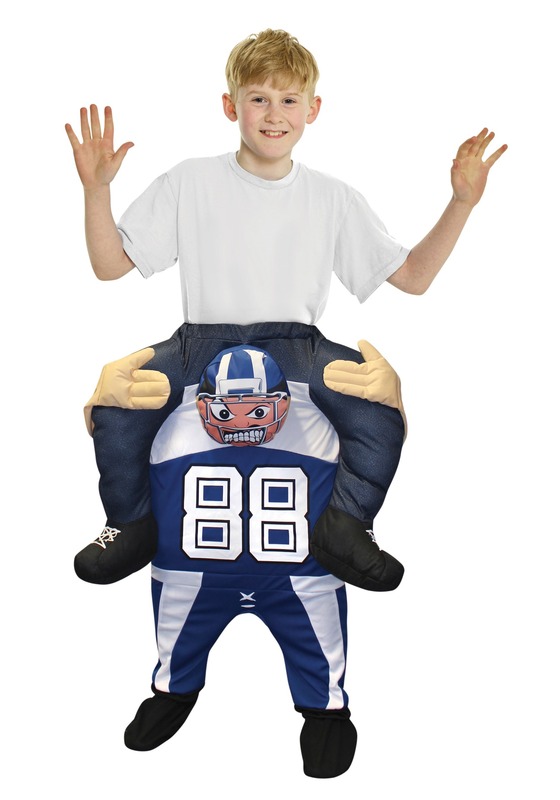 This Piggyback Football Player Costume for Kids was made for a pigskin-obsessed youngster like yours. In it, they can parade around trick-or-treating, all while hearing the soft roar of the crowd and feeling the bright field lights on their face, wherever they roam around the neighborhood! This clever costume creates a neat optical illusion that will delight your little quarterback to no end! It's a clever suit that makes it appear as though your child is perched high on the shoulders of a uniformed team member, when in reality, it's just your kid, walking around on their own legs! Cool, huh? It's sort of like a secret fake-out play we set up for Halloween night. Stuffed "legs" wrap around the football player's shoulders, making the whole look so much fun, it may very well send Halloween into overtime for several hours, at least! You really nailed it with this look! Your child gets to bring their favorite past time (football) right into their favorite holiday (Halloween, duh). So make sure they practice their plays and especially their victory wave, because your kid is in line to be the MVP of the costume parade!